You are here: Home › Practical gardening › Plant types – all those acronyms! Plant types – all those acronyms! • Comments Off on Plant types – all those acronyms! 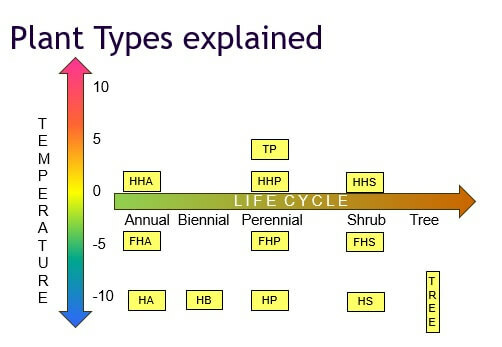 Plant type abbreviations are simple once you understand them! The first letter(s) refer to the hardiness and the final letter refers to the lifecycle. Thus HP is a Hardy Perennial and HHB is a Half Hardy Biennial. Of course there are trees that do not withstand freezing conditions, but apart from a couple of frost hardy palms they are not commonly sold as garden plants in the UK – for practical reasons. Annual: An annual is a plant that usually germinates, flowers, sets seed and dies in a single year. It may occasionally overwinter if flowers are removed and the plant fails to set seed. Biennial: A biennial is a plant that takes two growing seasons to complete its lifecycle and set seed. Typically, they flower in Spring, the seeds germinate in summer and a small plant overwinters before maturing and flowering the following Spring. The parent plant usually dies after flowering. Perennial: A perennial is a plant that lives for more than two years. Herbaceous perennials grow and bloom over the spring and summer, die back every autumn and winter, then return in the spring with new shoots growing from the crown at ground level. Perennials may also set seed after flowering as an annual plant does but they do not die thereafter. In the simplest terms ‘hardiness’ is a measure of the lowest temperature that a plant will survive reliably. Hardy: A hardy plant is one that survives the winter in the UK. This can be in its full form, with just the root and basal shoots or as a seed. Hardiness generally depends on where the plant originates from. A plant is able to survive the coldest temperatures experienced in its home environment otherwise it would die out but plants from warmer climates such as South Africa often need protection from our cold, wet winters. Frost-hardy: A frost-hardy plant withstands short frosts down to about -5oC but dies if it is much colder. Half-hardy: A half-hardy plant does not survive freezing temperatures: plants need winter protection, seeds can only be planted direct outside once frost danger has passed. Tender: A tender plant is usually from tropical zones and needs to stay several degrees above freezing at all times. Many tender plants are grown as houseplants and kept indoors all year round. ← Mulching – Why & What?